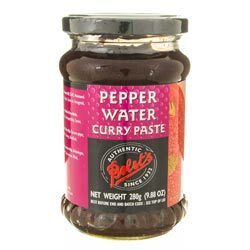 • Boil 1 tbsp Bolst's Pepper Water Curry Paste with 3-cups water for 15-minutes. • Add Salt, strain, and serve hot as an accompaniment to rice. Instead of water any soup stock may be used. Ingredients: Water, Tamarind, Sesame Oil, Peanut Oil, Chilli, Mustard, Pepper, Salt, Acetic Acid, Cumin, Garlic, Turmeric, Fenugreek, Curry Leaves. "Dear Spices of India, I'm a massive fan of Indian food and enjoy cooking it most of all. I saw the Masala Dabba on a cookery program on TV last week and it was the answer to a prayer of how to store my spices. Spices of India seem to be the only site offering a variety of sizes and package options. I ordered the largest spice box on Sunday and it arrived the following Tuesday. All this during Christmas week too. Great site, great service. I will certainly be ordering more form here in the future..."